The US-based athlete chats about his impressive year on the track and roads as he now looks ahead to the cross country season. Marc Scott was the first British athlete across the line in the European Championships 5000m and tops the 5k road rankings by five seconds – but who is he? The Yorkshireman has spent the last five years studying Sport and Exercise Science at the University of Tulsa in the States, training as an elite athlete alongside his degree. This may go some way to explain how he’s slipped under the radar of many of this nation’s athletics fans’. However, Scott is something of a stalwart of the British cross country team, albeit in the junior ranks. The Richmond & Zetland athlete is planning on transferring his burgeoning success at the U23 European Championships to senior level this winter. The fact the 24 year-old has just become a full-time professional runner, sponsored by Nike and representing the Bowerman Track Club when competing around the globe, could help his cause. 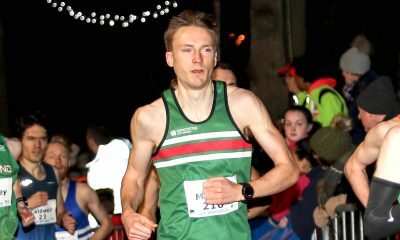 The 28:57 10k athlete – who ran his PB when beating Andy Butchart to the Trafford 10k title at the beginning of September – is rightly confident in his abilities, but remains grounded to his domestic club athletics roots. 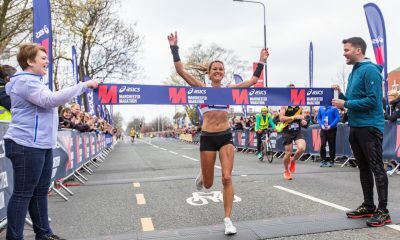 Asked for a comment on the recent announcement by Trafford 10k organiser Dave Norman that he will be stepping down from the helm of putting the race on every year after two decades, Scott was keen to pay credit to the Fast 10: class of 2018 star and 2:18 marathoner. “It is with great sadness to hear Dave has stepped down from his role,” he tells Fast Running. “He continues to drive the sport forward and people will miss this event if it can no longer be on the schedule. Many top class and regular club athletes alike will agree wholeheartedly with Scott’s sentiments. 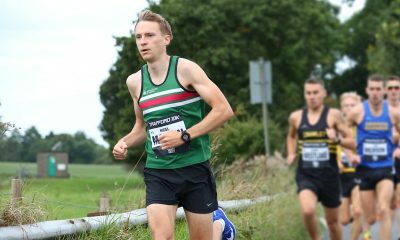 Scott’s Trafford win came just over a week after an emphatic win and another PB at the Mid Cheshire 5k, where he ran a rankings topping 13:45 at the English Championships race. Earlier in the summer, he won 5000m gold at the British Championships, beating Andy Vernon and Chris Thompson, before going onto finish first Brit and fifth overall at the European Championships in Berlin. These international honours came after winning the much-coveted NCAA (National Collegiate Athletic Association) title over 10,000m in 2017. What does Scott put these undoubted career highlights down to? “I can dedicate these successes down to a number of things,” he explains. “Firstly, I had a number of years at Tulsa which were injury-free, where I logged plenty of miles and was able to be very selective with the races I wanted to run. Consistent training throughout this time was very important. Rather than hitting some high-end sessions once every few weeks, I worked hard, but made sure not to push so much where I wouldn’t be able to string sessions back-back. Scott continues: “I benefitted by training with a group every day and being held accountable to get the training done. There were guys to push me who have also gone onto being a ‘pro’. Training partners were certainly not a problem for the 7:43.37 3000m man in America. In addition, Scott’s shares the same agents (KIMbia Athletics) as fellow Bowerman TC members, Evan Jager and Shalane Flanagan, so he’s not short on elite athlete contacts either! 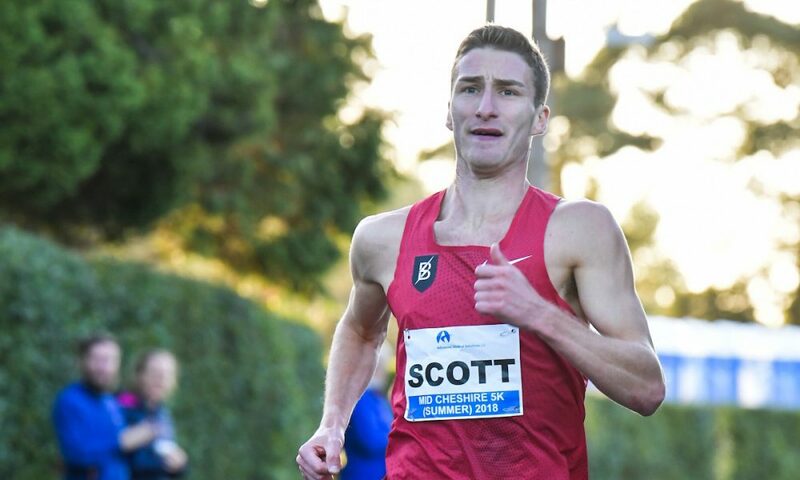 Scott is coached by Bowerman TC’s Jerry Schumacher, who he says looks after him “wherever I may be in the world”. He continues: “There are times where we are expected to be in Portland, but we do travel a lot so we always figure out where I may be and how we will continue training at a high standard. The UK’s fastest 5k road runner in four and a half years does not receive any funding from British Athletics. 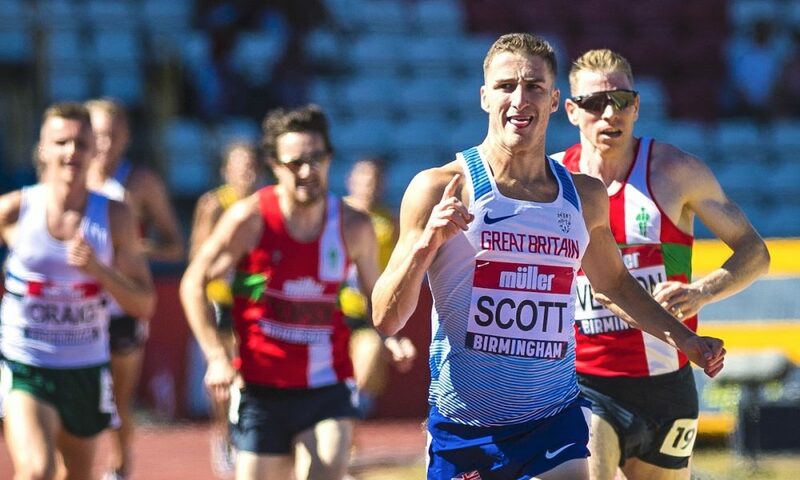 Scott hopes he will be added to the funding list when it is announced in November because he has hit the required standards, adding that he would be “very grateful for British Athletics’ belief and support for the future”. In the meantime, he is supported by his sponsor Nike, which enables him to afford to train and race full time. “Nike pay me a salary and provide all my kit, which usually involves two shipments a year with minor drops in-between,” he says. “On top of this, I have an allowance for personal clothing and so on. My agents sort out my race entries, accommodation and travel. With all the travelling and racing Scott does, he could be forgiven for looking forward to a well-deserved end of season break. While he is now doing just that, he had hoped to follow up his performance at the recent (and bizarre) IAAF Continental Cup in Ostrava with one final race of the summer. Namely, an attempt at a 22 year-old British record. He explains: “After talking with my coach we knew I could hit a quick one before the season was out. This was going to be a road 5k, targeting the British record – Rob Denmark’s 13:30! While Scott is undoubtedly making a name for himself on the track and roads in the UK, he has earned more GB vests on the country. The leggy Northern athlete enjoyed a decent outing at last year’s Great Edinburgh International, and has two top 10 results from the U23 European Cross Country Championships to his name. 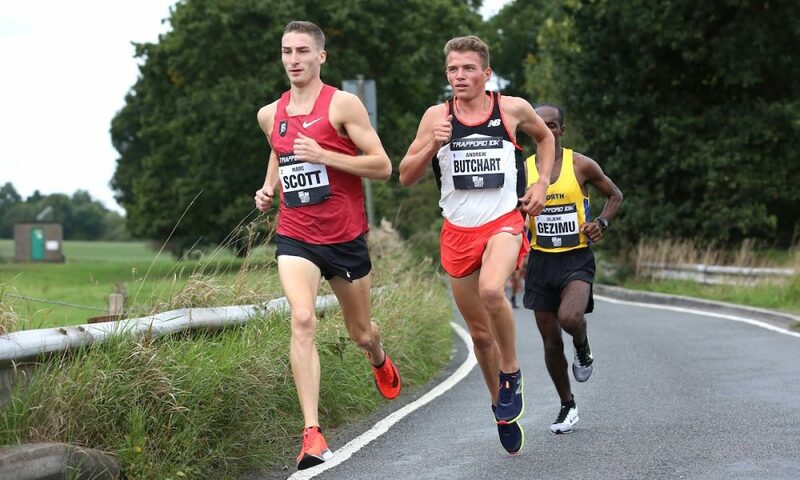 Scott has also featured regularly at the sharp end of domestic national championships, alongside excelling as a junior in mountain and fell running. So how does the ambitious young athlete train for the cross country season? Scott gives some further insight into his training regime: “My favourite sessions are usually the longer ones. I thrive on the Tuesday sessions, particularly ones with long reps and short rests. “When I’m in the US I usually train with about 10 other guys on the Bowerman team. When I’m in the UK I train with my club (Richmond & Zetland) for sessions. To keep up with Marc Scott’s development over the next few months and years you can follow him on Twitter and Instagram.